Many companies are struggling when it comes to managing their social media engagement. But being active and posting frequently isn’t enough to connect with audiences. The most successful brands rise above the fray and engage audiences through emotional content on social media. And even then, getting an audience to not only read what you’re writing but to act, via commenting and sharing, can still be a mystery. If you’re unsure of where to start on the path to creating engaging content, using tried and true psychology-related tips can be a great place to start. Carefully selecting a color scheme can positively represent your brand and impact readers on a psychological level. So, before you start sharing content across social media, choose colors that are synonymous with your brand. You’ll want a color scheme that shouts your brand in the absence of any other visual cues. Spend the time in your visual marketing efforts to get this right. 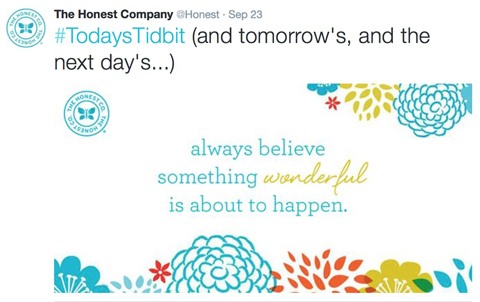 The Honest Company does this right. They have a signature color scheme they use across their social channels; it’s instantly recognizable by their audience and proclaims to anyone familiar with their brand that this is a piece of content they’ve created. Don’t forget the power of imagery. A strong image serves as the front door to your content, it needs to draw a reader in and make an impression. Posting a powerful image will make you grab attention as readers are scrolling through their social news feeds. 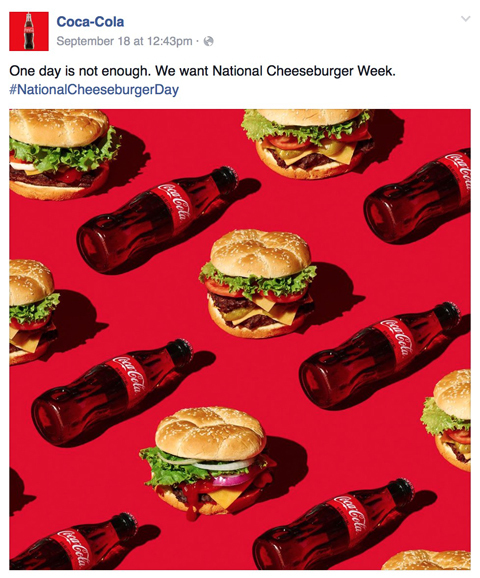 In this image of burgers and Cokes, Coca-Cola hits the checkboxes for relevance, brand messaging, and iconic imagery to generate appeal. The best way to start a conversation with your audience is to ask for it. Write posts that pose a question, since questions intrigue. Humans are primed to answer: who, when, what, why, where and how; so writing some of your social media posts as questions can create ongoing conversations. Now that you’ve asked a question be prepared to establish a healthy back-and-forth with your readers. Find out what they want, and provide it to them. Readers will remember the positive interactions they’ve had with your brand, and they’ll continue to engage the next time you come up in their news feed. Since you gave them a glimpse into your brand personality, they will trust you. Whether aware of it or not, you are always expressing emotion in your posts, provoking a response in your readers. To take advantage of this opportunity, try to share good news and useful information. As you prepare a post, ask yourself what emotion does it convey? Avoid coming off as bored, anxious, or surly. Instead, portray your brand as happy, friendly, and generous; this will elicit goodwill and draw people to your posts. 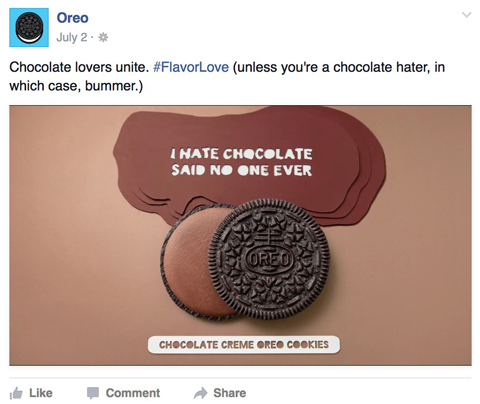 Oreo has a history of doing this well; all their social posts project a brand that is light hearted and fun. If you have not yet mastered the intricacies of a strong online presence, keep these tips in mind when crafting social media posts. Think carefully about your brand personality in creating social media content and don’t forget that this extends to colors, images, and words. Follow these tips to create conversations that will emotionally connect with your audience. Once you’ve learned to express your brand personality in a positive way, start digging deeper into what makes people tick (and share) on social media.